I love beaches… I’m quite sad that last summer, I was not able to visit even one beach.. I think the last beach I visited was in Pagudpud, Ilocos Norte,and it was a year ago. 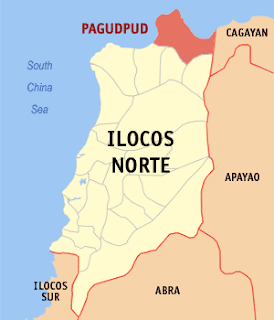 Anyway, Pagudpud (PAH GOOD POOD) is a coastal resort town on the northernmost tip of Luzon in the Philippines. The South China Sea lies to the west and north. 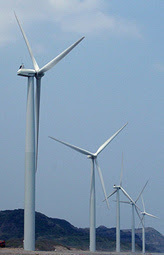 Pagudpud is bounded to the south by the town of Bangui, the home of the first power generating windmill farm in the country. Pagudpud beach is reputed to have the longest contiguous white sand with mighty waves and strong winds that can compare to Hawaii. That is why foriegners love Saud white beach. Its breathtaking views, white-sand beaches and crystal-blue water makes Pagudpud a haven for tourists. I like Saud more because they are not so crowded like Boracay. This place is worth the trip and money. I definitely recommend this place. This is one of my favorite places in the Philippines. Pagudpud is 548 km from Manila and 75 km from Laoag City. Some bus companies will take you straight from Manila to Pagudpud. You may try Florida Lines because they go straight to Pagudpud. Their terminal is located in Sampaloc, Manila, near UST. The fare is pretty affordable for a deluxe bus that has comfortable seats and, believe it or not, a toilet room. It costs around P600. The buses usually travel during the night so you could sleep the whole travel time. The trip is long. If you leave Manila at 7:30 p.m., expect to arrive in Pagudpud anywhere around 5 a.m. and 7 a.m.
From Manila to Laoag, the ride takes about 10 hours via the northwest highway. For a casual traveler, Philippine Rabbit, Partas and Farinas Transit have frequent buses heading to Laoag. From there, take a minibus to Pagudpud. Once you arrive to Pagudpud, board a tricycle and ask them to take you to Barangay Saud. They will charge you P50.00. If you will use your own vehicle, take the North Expressway at Balintawak and get off at Dau exit. Head for the coastal road. You will pass by Angeles City, Tarlac, Urdaneta, Pozzorubio, and Rosario. Proceed further north, past San Fernando (La Union), Vigan (Ilocos Sur), and Laoag (Ilocos Norte). Take the road towards Cagayan to reach Pagudpud. It is the fifth town from Laoag City. By air and land, 55 minute flight on PAL (4 weekly flights) from Manila to Laoag. 1.5 hours by car from Laoag to Pagudpud (60km). and these are nice pics mommy irish!